The Regret of a Flower will leave you breathless and somewhat speechless as it brings you to tears, laughter, and self awareness. Gail Thornton does a skillful job of turning events considered mundane or controversial into art on the page. The visions grip the reader, allowing the scenes to play out clearly in their mind. It is easy to imagine a wold of innocence coming of age, as well as a world suffering the consequences of actions not realized. Friends, children, and warriors all combine to enhance awareness of this talented poet’s command of the language. Gail paints scenes and conjures images others can only dream of creating. Never before has poetry been so captivating while gripping reality so closely. Love, loss, and mental illness are all handled with a skilled hand to draw the feelings to the surface. 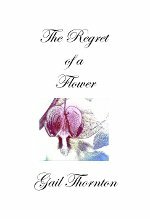 Reading The Regret of a Flower takes the reader through every emotion known to mankind; the intensity of each one is felt through the entire being. It is all on the line as this amazing book gives a glimpse into the heart, the soul, of the woman behind its creation.